My series of “Before and After” images began after a brief exchange with Pippin Parker and Casey Chazboe on Twitter about the nature of “pure” photography. I contend that if it exists, it's not important. I’m not sure that photographic purity is actually a thing. The idea challenged my notions about the importance of image manipulation versus straight-from-camera images. A few of these images illustrate retouching and large-scale manipulation, but most are simple adjustments to a RAW digital image. ​The point of seeing these images side-by-side is to realize the locked up potential in nearly any image, and how to look at an image and see its full potential. An image, straight from camera, is flawed from the start without some intervention to bring out its real beauty. The very act of capturing an image alters it. The image will exhibit more or less sharpness based on the lens aperture used to capture it. If you stop the lens down too much, sharpness may decrease because of lens diffraction effects. If you’re shooting JPEG, the computer in your camera has decided how to process that image. JPEG image compression, which is also the means that provides a preview image on the camera’s LCD screen, throws away information that the camera had captured, and it is lost forever. If you’re shooting a wedding, or a fast-paced portrait session. there is absolutely nothing wrong with shooting JPEG. If your camera is locked down on a tripod while you wait for the light to come around in Monument Valley, you probably want to keep all the information your camera can gather. In that case shoot RAW. None of this is particularly complicated. Even the best lenses cause degradation of image data - some more than others. These are Nikon lenses, some of the best in the world, but they're not perfect. Capturing an image digitally is, in my opinion, a more faithful representation than shooting on film. An image on film can be limited by the grain structure, inherent contrast, or thickness of the film. Only color transparency film - slides - are fully intact pieces of photography that require no further manipulation. However, the only way to see them is to view them by transmitted light - thus introducing another optical limiting factor - or to hold them up to the light and squint at them. Film, positive or negative, intended for photo printing must then go through at least one more optical process, further limiting the amount of information. That image is now subject to the characteristics of the paper it is to be printed on, as well as the built-in flaws of even the best enlarger lenses. An image on film that is destined to be scanned for production, even at the highest resolutions, is subject to massive data loss, and many drum scanners convert images on the fly to subtractive color - the familiar CMYK profiles required to print an image on paper using printing inks. That color space is tiny compared to Adobe RGB, ProPhotoRGB, or even the nearly-universal sRGB that I use for the best cross-platform compatibility. The great American 20th century photographers - Minor White, Ansel Adams, Edward Weston, and others - were master image manipulators. There is absolutely nothing pure about their images. One of Ansel Adams’ darkroom enlargers had 36 lightbulbs that could control exposure on certain parts of the image. 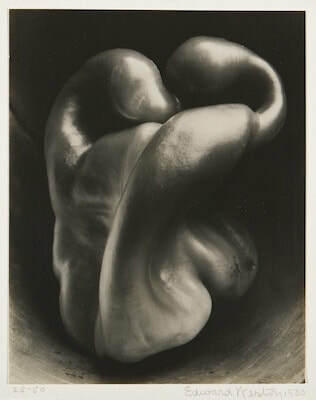 Edward Weston’s most famous images took hours and hours to create in the darkroom -a number of test prints followed by hours of pinpoint dodging and burning. as well as localized chemical influence were used to achieve local exposure and contrast control. Of the thousands of prints I created in my own darkroom over the years, not one - ever - was printed straight, with no dodging, burning, cropping, toning, or other manipulation. I’ve had similar conversations about music - vinyl versus digital. Vinyl is, for some reason, very popular right now. People say it has a warmer sound, that all sound is a physical process, and that only vinyl can faithfully reproduce the composer's or the musician’s intent. Bull pellets. Like photography on film, a vinyl record only has one pristine play session, much like a color transparency. After that, it is slowly, but surely, degraded by every subsequent play. It’s okay to say you like the way that analog sound is created by a vinyl playback, but don’t try to convince me it’s better. ​Come back next time, and I'll rant about the importance of megapixels and camera resolution.